Sack off the local van – this babby recipe is the business. Place the doner under the grill for a couple of minutes at the end to make it nice and brown. Total Cost - £9.75 - This covers absolutely everything. All we assume you have in your kitchen beforehand is SALT, PEPPER AND OLIVE OIL. Throw mince into a bowl. Add a teaspoon of cumin, a teaspoon of fennel seeds, 1/2 a teaspoon of cayenne and a teaspoon of dried oregano. Add 1 grated clove of garlic. Season with salt and pepper. Mush everything together. Form the mince into a fat sausage, similar to something like an aubergine, and then wrap it tightly in tin foil. Place in oven for 30 minutes. Tzatziki time. Into a bowl add your yoghurt, 1 grated cucumber (squeeze gratings to remove excess water), the juice of a lemon, salt and pepper. Mix together. Cover, and chill. Pickled onions. Finely slice your red onion. Place slices into a bowl. Squeeze over the top the juice of a lemon. Add a pinch of salt. Scrunch the salt and juice into the onions. Leave out until you serve. The acidity of the lemon will take the sharpness out the onion. After 30 minutes, remove the lamb from oven. Take off foil. Place it back in oven, under the grill, for 1-2 minutes on each side, so it gets brown and crispy. Watch that it doesn't burn. Remove doner from oven. Slice it thinly with a sharp knife. Take your onion and add a big handful of fresh parsley to it. Assembly time. Take a warm pitta. 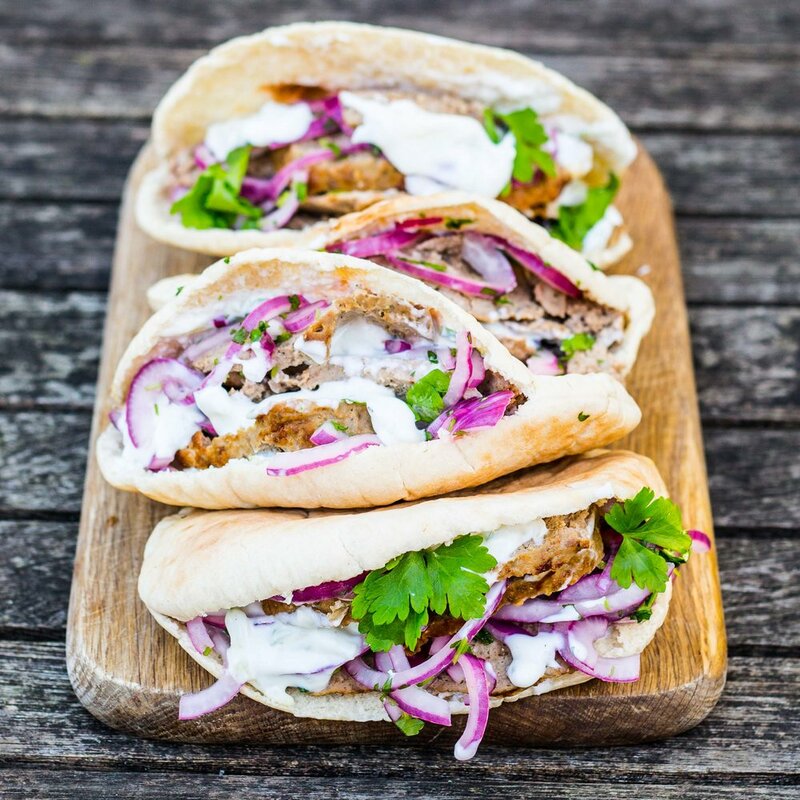 Dollop in some tzatziki, then add some doner strips. Spoon in some pickled onion, dollop on a bit more tzatziki, and tuck in!